Allan R. Bevere: What Was on the Menu at the First Thanksgiving? 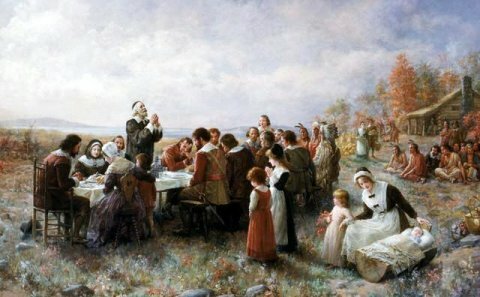 The feast, held in 1621 at the Plymouth Plantation in Massachusetts, was very different from the Thanksgiving dinner that we enjoy today. It went on for three whole days, and the colonists and their Native guests probably didn't sit at a table or use forks. Staples of modern Thanksgiving-- like pumpkin pie and cranberry sauce-- weren't even served. So what did they eat? While nobody knows the full menu, based upon various sources, it's possible at least to make some educated guesses. The details are filled in here.